Here's another super-easy recipe for you guys who are short on time but want something healthy and delicious. Using one of my favorite ingredients in the world, mushrooms are the star of this simple recipe you can whip up in mere minutes. 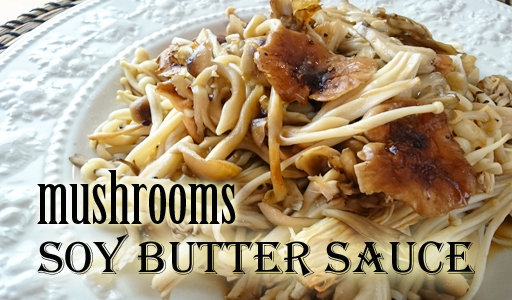 I'm using a variety of mushrooms but you can use whatever that's available. Here in Japan we are blessed to have a wide variety of mushrooms that are really inexpensive, so it's easy to go crazy. Line baking pan with aluminum foil. Place mushrooms onto the foil. Add butter. Season with salt and pepper. Fold foil over to cover mushrooms. Crease sides of foil and secure. Bake in preheated oven for 10-12 minutes at 200C or 450F. Carefully open the foil. Serve on plate with a dash of soy sauce. Enjoy! Don't forget to subscribe to this blog and while you're at it, subscribe to my YouTube channel where I post 6 videos per week! That's 3 recipes per week plus 3 other random stuff all related to either travel or food with a dose of fun. You can jump to TabiEats YouTube Channel Here! Whether or not you're busy with no time to spare, give this recipe a try and let me know how you like it. Cheers everyone!